All our luminaires are classified as IP66, which means that they are completely sealed: sand, dust, insects, dirt of any sort, humidity, salt... none of this can penetrate their polymeric structure. 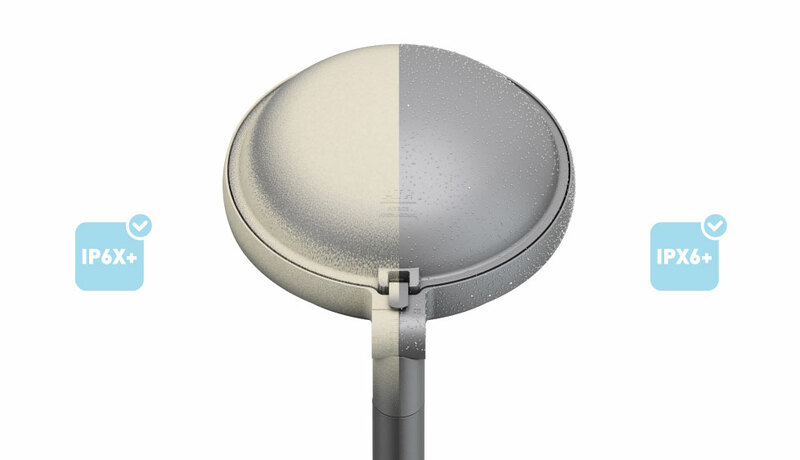 Several devices and a rigorous manufacturing process ensure that the seal remains perfect in any situation –even in tropical climates–, providing absolute protection of each electronic component and internal element of the street light. This feature guarantees an unchanging light output, extends the lifespan of the products and eliminates maintenance costs and fails related to the degradation of the circuits. It solves, similarly, the annoying stains, opacities and condensations which appear on the diffuser due to the penetration of external agents. The interior of the polymeric frame remains like newly installed even years after its placement. The access system to the lamp also contributes to keeping the tightness stable even after the luminaire has been opened: this mechanism consists of a single lock, manually operated, which does not require additional tools. Thus, after completing any task inside the optic block and having returned it to its functioning position, the seal will not be diminished in the slightest. Protection against penetration of solid bodies: our equipment passes tests with constantly moving clouds of dust of 2 kg/m³, with a diameter inferior to 75 µm. Protection against penetration of fluids: ATP luminaires withstand water projections of 100 kN/m² from all angles. These two tests are a standard for any streetlight of our firm, and that sets a level of reliability which has never been achieved by any other manufacturer. ATP was the first and remains the only manufacturer who holds a degree of protection IK10 for the pole and the access panel, and a category IP66 for column-access panel surrounding; both certified by AENOR. This exclusive ATP panel seal prevents the penetration of solid bodies and fluids inside the column, and that ensures full protection against electrocution and safeguards all the internal components. In addition, the IK10 guarantees the maximum impact resistance of the whole structure: in fact, poles and access panels pass without any difficulty collision tests greater than 50 joules, which is more than twice the UNE-EN 50102/A1 standard for the IK10 category.